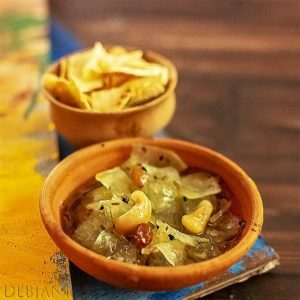 Bongs are popular for their Sweet Achar prepared with Jaggery and/ or Sugar and there in Kolkata people mostly bought spicy Pickle (UP or Punjab Variety) instead of preparing it at home as they prepare Sweet pickle at home. 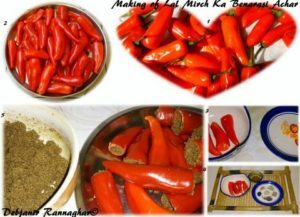 However, in my place, we used to have homemade spicy pickles from Benaras since My Rangama (Aunty) was originally from the holy city of Benaras and she used to bring the special “Lal Mirch Ka Benarasi Achar” whenever she went to her parents’ house. Missing those days… having food with all the members of our 18 membered family….Rice… Daal…Macher Jhol and a small bite of “Lonkar Achar!” Yes, that is what we called “Lal Mirch Ka Benarasi Achar” in Bengali. 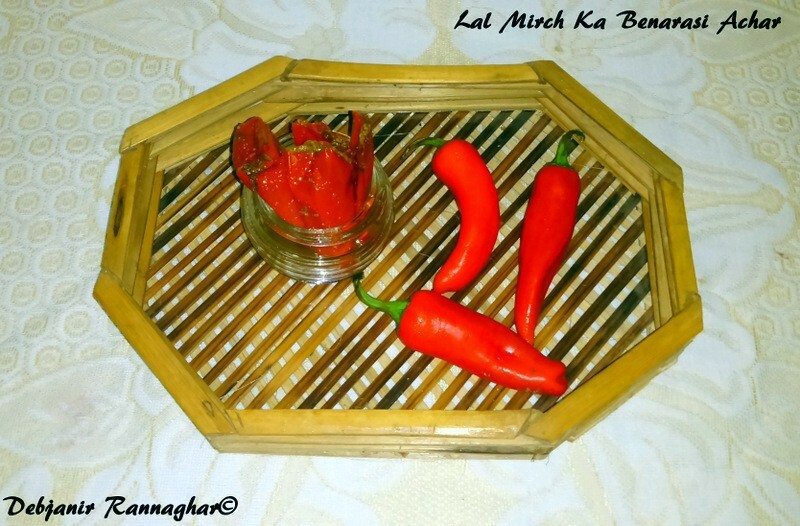 “Lal Mirch Ka Benarasi Achar”…. As they called it! The super popular Spicy Stuffed Red Chilli Pickle from the State of Uttar Pradesh and specifically from Benaras is also known as “Bharwaan Lal Mirch Ka Achaar”. India is the land of spices and Indian Pickles are full of the flavor of spices. Every state of this country has own variety of Pickle and each variety is equally flavorful and tasty. To be very frank, I never thought of preparing Achar in my kitchen! After all, a variety of Achars are easily available in stores and moreover My Ma and Mom in Law specially prepare Achar for us and we are loaded with different Bong variety of Achar every year! But; Plans are always relative; ain’t they? When I saw these beautiful, Red Chillies in the Veggie shop I just couldn’t resist myself. They were nothing but tempting! Initially, I was thinking of preparing a small amount of Achar but then thought of preparing Achar with at least 1 Kg Lal Mirch. Actually, we have a plan to visit both my and hubby’s place in coming weeks and I always bring something homemade for our relatives and this time Achar is one of the main items of my goodie list. Though Readymade Spices of Achar which is known as “Achari Masala” is nowadays available in departmental stores, however, I thought of preparing “Achari Masala” at home as well. Homemade spices are always special as they contain perfect measurement and I prefer to use homemade versions. 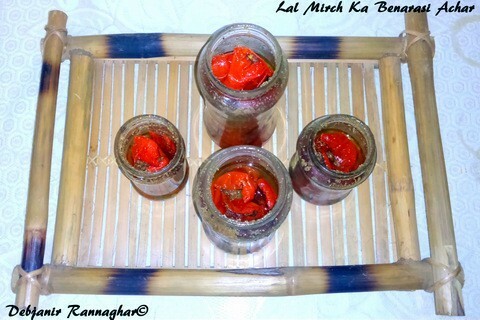 I have prepared “Lal Mirch Ka Benarasi Achar” with 1 Kg of Large Red Chillies which is around 40 Chillies. It took me around 450 g of homemade Achari Masala and 3 Cup of Mustard Oil to prepare the Achar. If you want to prepare the lesser amount of Achar then reduce the quantity of Masala accordingly. Wash Chillies thoroughly without breaking the green stalk and using a fresh cloth pat dry them. Then sun-dry Red Chillies for around 2 hours. There should not be any water on the Chilies. Remove the Stalk carefully from each chili. Next step is to open the Chillies to make them prepare for stuffing! One is to cut off the head of the Chilli and removing the white portion of the chilies along with Seeds. Another process is to make a lengthwise slit in the chilies and removing the inner content. I've used the options one i.e. for cutting the crown and then removing the inner content to make the chilies empty for stuffing. This is, however, a bit tricky process then the 2nd option. It can cause burning in hands and it happened to me but no regret! Now take entire Mustard Oil and heat the oil sufficiently for around 5 minutes or till heat comes from the oil. Remove from heat and then completely cool the oil for using in Achar. Take required quantity of Achari Masala and mix Turmeric Powder and Salt with the Achari Masala. Mix around ½ Cup of Oil in the Masala Mix to complete the Masala for stuffing. Now take Chillies one by one and using a spoon fill chilies fully with the spice mix. You need to press the Spice mix a bit to fill tightly in the Chillies. Now dip Stuffed Chillies one by one in remaining Mustard oil. 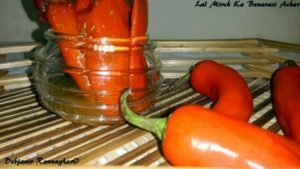 Place them in the Sterilized Glass Jars/ Bottles and try to fill bottles completely with stuffed chilies. Pour remaining Oil into the Bottle to cover chilies fully. Be generous in using Oil if you want to make proper Achar! 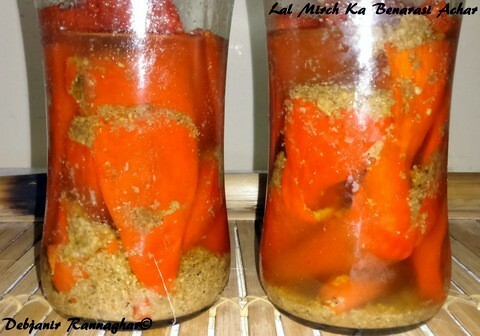 Now Close the Lid of the Jar completely and following the same process prepares jars full of Achar. It took me 2 big Bottle and 2 small bottles for making Achar of 1 kg Red Chilli. Place the Jars(s) in full sunlight for around 7-12 days. It took me around 10 days to get My Achar done completely. 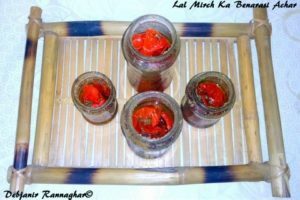 This “Lal Mirch Ka Benarasi Achar” can be stored for more than a year, however, you need to place the bottles in Sunlight once in a while. 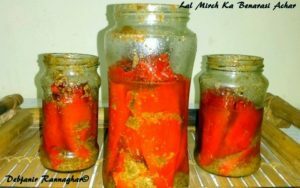 “Lal Mirch Ka Benarasi Achar” can be stored for more than a year but you need to place the bottles in Sunlight once in a while and is a good accomplishment for any Indian Rice or bread including Parathas. You can check some of the Rice and Bread recipes from my blog with which this Achar can be served: Sattu ka Paratha/ Chatur Paratha, Bedmi Poori, Kachori, Peas Pulao, Fish Pulao, Sweet Pulao.